Easy to make with a lovely nutty flavour and a pleasantly toothsome texture, Mushroom Orzotto is a wonderfully versatile, family friendly, main dish or side. Orzotto is a classic Italian dish, made from pearl barley. It’s very similar to risotto, although it’s much easier to make because you add all the liquid at once. I prefer it to risotto because I find pearl barley is heartier than rice and has a great flavour too. I was inspired by Nigella Lawson’s Saffron Orzotto in her book, Nigelissima. It’s gloriously indulgent and comforting as the recipe includes wine and cheese. My Orzotto is no less comforting or delicious, but it is a tiny bit healthier. Rich in fibre, protein, manganese and selenium, pearl barley is low in fat. Plus, it is a good carbohydrate. 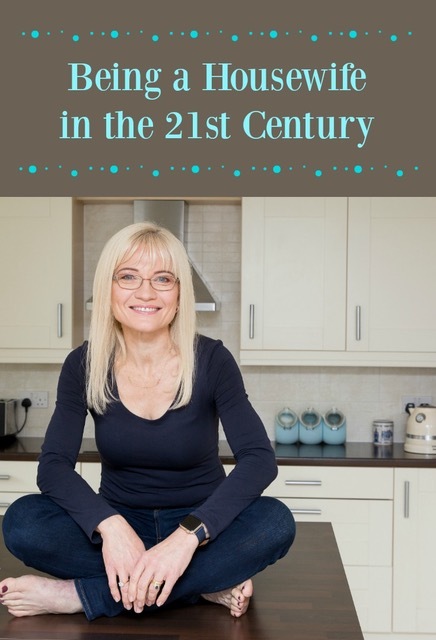 Our bodies need carbohydrates to thrive, especially if we are following a healthy eating or weight loss programme. Good carbs include pearl barley, brown rice, beans, whole grains, oats, and even peas and corn. Good carbs can help fill you up, and as most have low glycemic indexes, they help regulate your blood sugar and keep you feeling fuller for longer. Mushroom Orzotto will serve two to three as a vegan main dish, or four as a side. It keeps beautifully. Simply cool leftovers quickly and keep in the fridge for up to two days. Reheat gently in a saucepan, adding a splash more stock or boiling water if needed. In fact, I often make my Mushroom Orzotto the day before a dinner party. It’s one less thing to worry about on the day. And now it’s normally just my husband and I at dinner during the week, it’s also a great cook once, eat twice recipe. It’s also very easy to make! One of the things I love about My Mushroom Orzotto recipe is how versatile it is. I can switch up the flavour simply by varying the herbs and spices I use. When I serve Mushroom Orzotto as a side dish with my Baked Cod with a Sautéed Veggie Topping, I add chopped chilis for a bit of warming heat. Other times, I stick to Mediterranean herbs and spices like basil, oregano and thyme and leave out the chilis. I also like to make Mushroom Orzotto with tarragon when I serve it with chicken. If I’m making it as a vegan main dish, I add a generous pinch of saffron or a teaspoon of Harissa to the stock before I add it to the pan. If you want my Mushroom Orzotto recipe to be vegetarian or vegan you must, of course, use a vegetarian stock. However if that is not a concern, you can use chicken stock instead. I often just use stock made from a cube, but I choose a good, flavourful brand. Serve my Mushroom Risotto as a vegan main dish, or as a meat eater’s side with fish, chicken, or anything really! Heat 1 tablespoon of the olive oil over medium heat in a large casserole or saucepan with a lid. Gently sauté the onion or shallot until it begins to soften. Grate in the garlic, and the chili (if using) and cook for a minute or so. Turn up the heat a little and stir in the pearl barley, mixing it well with the oil, onion and garlic. Pour in the stock all at once and add the basil, oregano and some salt and pepper. Bring the orzotto to the boil, stirring constantly so it doesn't stick. Then lower the heat to a simmer and pop a lid on the pan. You will be cooking the orzotto for about 40 minutes, so give it a stir every 8 to 10 minutes. After the orzotto has been cooking for about 20 minutes, heat the remaining tablespoon of oil in another saucepan. Sauté the mushrooms gently for about 8 to 10 minutes. Add the mushrooms to the orzotto. If all the stock has been absorbed at this point, and the barley is not yet tender, add one or two tablespoons of stock or boiling water. Turn the heat to low and cook for another 10 minutes with the mushrooms, stirring once or twice. Taste (be careful, it's really hot!) and add a bit more salt and pepper if you like. Serve garnished with fresh basil or parsleyl, if you have some on hand. Otherwise a bit of dried parsley will do nicely. This sounds delicious. Unfortunately barely is not gluten free and it is one of the foods I miss. Thank you so much, Judee. I’m so sorry not to provide a gluten free alternative with this recipe – I would miss barley too. I love the ingredient profile in this dish April. 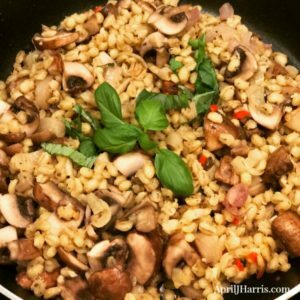 I think today barley is an underused and underappreciated grain and I’m thrilled to see it featured in this earthy fall “side.” I wanted to give your recipe 5 stars, but it’s only allowing 3..so sorry! Very excited to see this recipe, April. I love mushrooms and adore risotto but am also a big fan of barley. Putting all the liquid in at the beginning really appeals to me, too. Thank you and pinned! 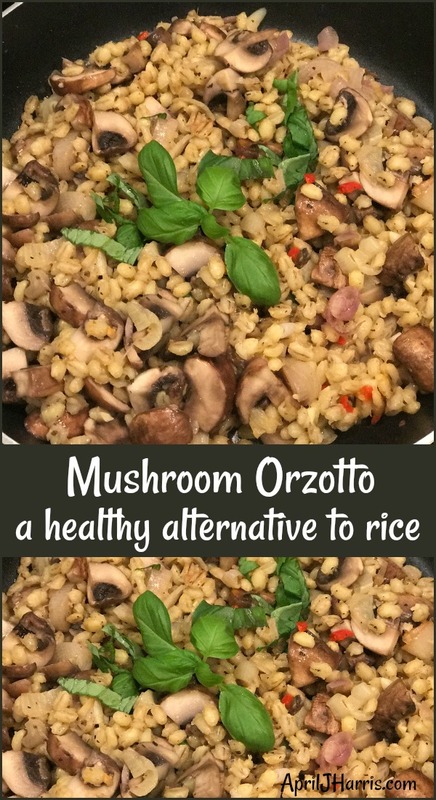 Your Mushroom Orzotto looks like a great side dish that I would love to try. Thanks so much for sharing with us at Full Plate Thursday. Have a great weekend and come back to see us real soon! Thank you so much, Miz Helen! I hope you and yours are having a wonderful Labour Day weekend! Thank you so much, Miz Helen! I’m sorry I’m so late to the party!! We are getting ready to go away again and I got a bit overwhelmed. I really appreciate the feature. Take care and have a lovely week!